The Past Sea (also known as the Elapsed Sea) encompasses the continents of Myar Aranath, Arktwend, the Skaragg Islands, and the Belt of Kilé. Only the archipelagos to the southwest are tropical; the other continents are harsh and grey, which is due to the magical contamination from the war in Myar Aranath. The Spice Channel is the narrow strait between Nehrim and Qyra. Much of the trade between the two countries passes through it. The Red Sea encompasses the continents Nehrim, Qyra, Arazael, and Enderal. There are many different historical narratives that vary from people to people. The one documented below is the one on which the continents dominated by the Light-Born (the "Civilized World") have "agreed." **** b. St. The Universe is created from the Sea of Eventualities. **** b. St. Numerous civilizations rise and fall without a trace, following the Cycle. **** b. St. An unknown man performs the first instance of Apotheosis on his creation, the Goliath. He would later be known as The Black Guardian. **** b. St. The Pyreans emerge, rule for several millennia, and disappear without a trace. **** b. St. The first Aeterna, Asâtoron, emerges from a magical anomaly (the "Ruins of the Worlds") and creates the first Ash People. They populate Pangora and worship Asâtoron as a god. Only a few Ash People share Asâtoron's appearance and have a long life span. Asâtoron calls these people "Aeterna." **** b. St. Asâtoron loses his mind and orders a massacre of his own subjects. A civil war breaks out, and Pangora falls into chaos. **** b. St. A meteor strikes, splits Pangora into the individual continents, and destroys the majority of the Ash People. Asâtoron is never seen again. 0 a. St. Small, slim people claim to have originated from stardust and retreat into the earth. They call themselves the Starlings. 0 – 3987 a. St. The surviving Ash People spread to every continent; the modern races of Vyn emerge. Again and again, there are wars between them. Mankind learns to use magic for the first time. 3987 a. St. Seven Arcanists appear in the world of Vyn and claim to be gods: The Light-Born. They claim that Starfall was a punishment for the violence of mankind and break resistance against them by force. By means of powerful magic, they learn how to extend lifespans indefinitely and acquire a seat: Inodan, the city of the Gods. Although they establish different religious practices on each continent and regimes in their countries, their primary goal is to maintain stability at all costs. The continents ruled by the Light-Born are called the "Civilized Worlds"; those that do not belong to the "Uncivilized World." A long epoch of "peace" follows. The Light-Born will rule with virtually not interruption for the next 4244 years, occasionally resorting to force to maintain their rule. 4001 a. St. The Holy Order is established on Enderal. 4523 a. St. An Aeterna mage named Zoras, who claims to be the reincarnation of Asâtoron, revolts on Myar Aranath against the Light-Born. The revolt is brutally suppressed, and the land is completely destroyed. The Aeterna living there flee to the different continents. 4523 a. St. A new, long epoch of peace follows, which is called the "Golden Era." The countries flourish and develop — only small, political disputes and wars with the Skaragg and the wild Arazealeans intermittently disturb the peace. 8197 a. St. Narathzul Arantheal, son of Tealor Arantheal and the Light-Born Irlanda, instigates a revolt against the Gods. 8202 a. St. Narathzul Arantheal defeats and kills the Light-Born Erodan in the decisive Battle of Treomar between the followers and the enemies of the Light-Born. Arantheal banishes his father to a fortress in the northern mountains of Nehrim. 8203 a. St. During the Battle of Xarmonar on Arazeal, the Arch-Seraph Arkt betrays the Light-Born; nevertheless, the Light-Born still win the battle. Narathzul Arantheal is captured and incarcerated. Arkt is imprisoned on Tirmatral to confess his guilt before Tyr, but frees himself. He gathers the former soldiers of Narathzul and a battle for Tirmatral ensues. The land is completely devastated, and Arkt is confined to his old fortress in a magical prison. The land will serve as an example for the senseless violence and chaos caused by rebellion and is renamed "Arktwend." 8231 a. St. The events of Nehrim begin: A stranger joins the underground movement against the Light-Born and causes their downfall. 8234 a. St. The events of Enderal begin. ↑ 1.0 1.1 Dal-Monag, Derrek. “The elapsed and the red sea.” Vyn - A Geographical Overview, p. 3. ↑ 2.0 2.1 Dal-Monag, Derrek. 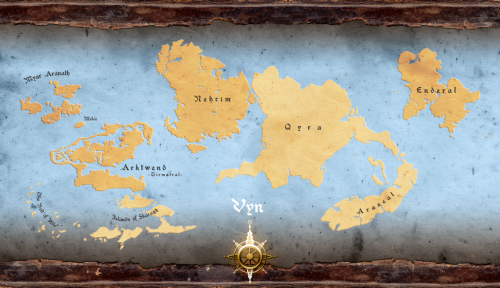 “Myar Aranath.” Vyn - A Geographical Overview, pp. 17-18.